How can you NOT learn from Ralph Fletcher?! After having just finished a nonfiction genre study cycle with my sixth graders, I knew that I could do better. Then, Ralph turned his attention to nonfiction, and wondered aloud what happens to kids, quite often, when they write nonfiction. Why does it often have a quality of sameness, and why does it feel formulaic and lifeless? Why do we focus on the five-paragraph format for nonfiction writing and not encourage writing that is playful, engaging, and humorous? Can we not story tell even as we write to inform? And, why does it feel as though nonfiction is something that is “done to” kids? Something that is not exactly enjoyable either to teach or to do? 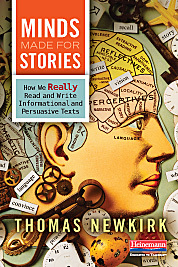 I’ve been wrestling with this idea, too, ever since I’ve read Thomas Newkirk’s brilliant Minds Made For Stories: How We Really Read and Write Informational and Persuasive Texts (which Ralph also referenced many times during his talk). All writing is narrated: it comes from a teller, a mediator, a guide who must win our trust, and in some cases wins affection. As writers we are asking something extraordinary: that readers keep going by choice and not out of duty. In my view, “information” is not enough of an incentive, unless we are writing a pure reference book. One of our indispensable tools is …ourself…a self we craft…that invites you, the reader, to stay with me.” (p.84). young writers need mentor texts that build a vision for what strong non fiction writing looks like, they need to “ride the momentum of a great piece of writing and find their own wave”. students should sound like kids when they write non fiction – they need to retain a sense of playfulness. Often, they can get numb from the facts they’ve researched for their writing and the prescribed format we as teachers often demand. “Beware dump truck writing!” he cautioned – writing that is loaded with information and lacking in voice. Then, much to our collective delight, he read aloud a wonderful piece he had written (for his soon to be published new book on writing nonfiction, I think): “Interview With A Coho Salmon”. Filled with equal amounts of facts about the life cycle of a salmon and corny jokes, we were entertained even as we learned all sorts of new information and terminology about salmon and the particulars about their habitats, spawning habits, and life span. This kind of writing was fun to read…and also seemed hugely fun to write! Ralph spoke of our instructional focus on Type A writing – writing that is geared to show expertise on a topic, rather than Type B writing – writing that is exploratory, and allows kids to experiment and practice with writing moves and forms. Both texts that he shared with us, “Interview With A Coho Salmon” and “Why the Earth is Farting” by Alan Weisman, were such excellent examples of Type B writing – we were engaged, we laughed, and we learned. This, we felt, was writing we would love to explore with our kids! Choose choice! let kids find out what they care about – choice leads to voice. Think audience – what information and format will work best? who do I want to read this piece of writing? Students should have another audience for their nonfiction, someone other than just their teacher. Don’t over do the pre-writing. Create maps to chunk information, not elaborate and time-consuming outlines. Think about small writing notebooks for topic and writing exploration. Help students focus large topics. Encourage students to interview as part of their research process – this allows them to find their focus, their zone of interest, or new perspectives. Rethink form. Why not several smaller pieces rather than one big article? In the real world, non fiction is exploding as a genre, but we teach in the same, formulaic way. Confer early in the process. Guiding kids to make good, clear choices early on sets them up for writing success. Remind them that skilled writers borrow from all genres. Value passion, originality and voice. Encourage the use of interesting, muscular verbs. Move from the what of the piece to the how of the piece. Celebrate edgy writing that makes you sit up and take notice! I left Ralph’s presentation full of new ideas and energy. In fact, I could not wait to get back to my classroom and share “Interview With A Coho Salmon” with my sixth graders, knowing full well that they would want to try it out immediately. And, this Saturday, I will share what happened when I did. I’m reading this with the Maine Writing Project! I am loving it. We are studying it together using Edmodo. So I’m learning two things. I would have loved to have been there with you to hear Ralph Fletcher, so great that you and Bonnie did. You know that each student studies their own passions, so that ‘choice’ word really is key, I think, & mentor texts that open up a world of possibilities to share what they’ve discovered helps immensely, so then it becomes still another ‘choice’. I’ll look for Ralph’s new book. Thanks, Tara for sharing so much about the presentation! 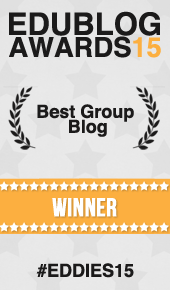 Tara, I am so thrilled that you wrote about your learnings from Ralph’s workshop. Isn’t he such a a great presenter? I saw in at his roundtable at NCTE. This note is what I have been talking about lately: Choose choice! let kids find out what they care about – choice leads to voice. All of us work better on things that we CHOOSE to do! The 12 steps will come in handy for our next Unit of Study: Research! Choice is key, isn’t it – both in topic selection as well as in structure. Good luck with the research unit – such an important one. This makes so much sense! When I think of books like those by David McCullough, David Hackett Fischer and others, I have been totally engrossed while reading because of the compelling narrative, as well as the fascinating information. I need to incorporate this list of tips to help my students write lively nonfiction. That’s how I felt, too – and I believe that that is the point Fletcher wanted to make. We know what engrossing writing sounds like – but that is (often) not the way we teach our kids to write!. Great things to be thinking about. I absolutely agree that good story telling is good storytelling. It is helpful when a guru encourages us along our inklings. Yes, a guru certainly validates those inklings…and so we are always grateful. Wow, I’m back there again with you. Wasn’t that a wonderful experience?! I love information writing so I’m so pleased that you have shared more ways for me to talk about the writing. I think it’s all about determining that reason “WHY” to write. If I’m solely writing to fulfill requirements of a report, BORING! But if I’m adding in “from the view of” or changing the setting/environment, I think the interest level immediately goes up! Can’t wait til Saturday! The “why” is always important to determine…but so is the “how” – that was my ah ha moment during Fletcher’s talk. Thanks for stopping by, Fran! Ever since Tuesday when I administered an end of year informational On-demand for my 5th graders, I’ve been thinking about this genre you write so well about today. I noticed students Tuesday not having a topic or returning to the animal they researched in 2nd gr. I wondered why. I thought about what topic I would pick if I had a choice. I realize I don’t read enough NF and don’t talk about NF so I, too would probably return to a topic from years ago. My students have an independent project to complete by June 1 – any genre. I decided after reading your post and last night’s TCRWP twitter chat, I need to do a NF writing piece and starting now, I need to read more NF. Thanks for the shot in the arm today. I needed your post today!! Well, lucky for us that there is so much going on in the NF world – we are lucky to have so many gifted writers and illustrators crafting fabulous texts that our kids love and love to emulate. Keep us posted about these NF adventures, Sally! Thanks for sharing the tips. Fletcher has had a profound effect on my teaching and writing. Can’t imagine either without What a Writer Needs. So glad that he has a new book coming out. I was so happy to hear of his new book, too – another Ralph Fletcher must-have book! It’s crucial to rethink form if we are going to move beyond the dreaded 5 paragraph essay. Looking forward to part ii of this piece. Yes! That was also the point of Newkirk’s book, which has me rethinking both my argument and nonfiction genre studies for next year. I’m a Writing Project person too! Long Island Writing Project. We are small and trying to grow so I am VERY impressed that your WP got Ralph Fletcher to present. Thank you so much for sharing what you learned. Years ago I read Ralph Fletcher’s book Walking Trees about his time as a writing consultant in NYC schools. I’ve been a big fan of his writing and his approach to teaching writing. My students are about to embark upon an animal research project before we visit the Bronx Zoo in a few weeks and I’ve been debating how I want them to go about writing this research. I am looking forward to your post on Saturday to see what your students came up with. I also look forward to Ralph’s (guess we are on a first name basis! Ha!) new book on nonfiction. Growing up, I never read much nonfiction as it seemed so BOOORING and I love a good story, as Ralph says. I see now that many nonfiction books are written in a very engaging way that teaches you information but also captivates your attention and features writer’s craft. I’ve enjoyed books like “Are you a Spider? and “An Egg is Quiet” as examples of engaging nonfiction. Meghan McCarthy’s nonfiction books are also very engaging. Great post! Looking forward to Saturday. We’ve been having fun with this new approach, Kathleen. How exciting to begin a writing project in conjunction with a visit to the Bronx Zoo. Your kids are so lucky.